Whilst sitting on a bus in the summer, I got an idea for a Christmas card. I am not sure why such an unseasonal image would ‘pop’ into my mind on one of the hottest days of the year, but I wonder if it’s because I was secretly wishing for cooler weather. I am definitely not a hot-house orchid, I am much more akin to a polar bear. I received some lovely comments on the Christmas card and I think people are expecting me now to do it every year… Well, I am not so sure about that…but who knows…watch this space. I am very patriotic and I’m proud to be an Englishman, so St. George’s Day for me is a day of annual celebration. So much so, that I think it should be an annual English bank holiday. So, with that in mind, when I was producing my Bear-a-thought calendar for 2007 I thought I would include St. George (in teddy bear format) as the illustration for the month of April. I chose one of my favourite bears, Augustus, to represent the patron saint of England and my friend, Jennifer A. Stephenson, dressed him appropriately with a helmet (with scarlet plume), a chainmail vest (emblazoned with St. George’s Cross) and a rather fiercesome looking wooden sword and shiny protective shield. Once Augustus was ‘suited and booted’ I had to find a ferocious dragon for him to vanquish. I wanted to make the fierce dragon look as fierce as a baby with a marshmallow (not quite sure where that expression came from, but it was the first thing that came to mind), so found a rather cute and endearing green-and-yellow dragon on the Internet. I set the picture up in my garden, using rocks from when I had the house renovated and created a dragon’s cave, set against the backdrop of a beech hedge. It was mid-April when I set this scene up, so I incorporated some of the flowers in the garden to create some ambience: daisies (the traditional flower of the month of April) and forget-me-nots which always flower in my garden at this time of year. The Forget-me-not is rather appropriate in this illustration in more ways than one, as there is a mediaeveal legend as to how the flower got its name. It goes that a strong and handsome knight, after returning from some war or crusade, was reunited with his fair maiden. On meeting her again, beside a riverbank, he stooped to pick some of the delicate blue flowers that grew on the riverbank. Unfortunately, the weight of his armour and his semi-recumbent position made him topple into the river and to his death. But before he succumbed to the swirling water, he threw the blue flowers to his distressed maiden, with his last words “forget me not!”. 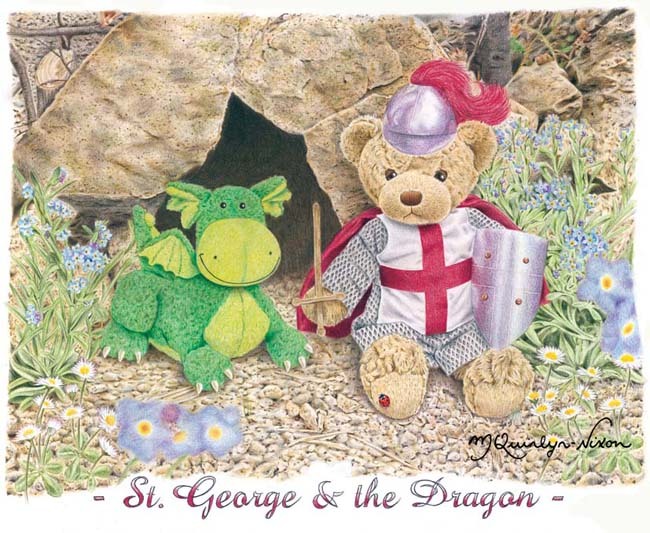 The St. George and the Dragon illustration was popular in the calendar and also as a greeting card, with the original illustration being purchased by an English customer, living in Spain, who has a small and select collection of my teddy bear illustrations.